So far this year there have been two films that received almost universal praise upon initial release, but which I came to late and was subsequently disappointed. The first was How To Train Your Dragon 2, and this was the second. Neither are anything close to resembling bad films, but nor did they show me anything that I was hoping for, given how much acclaim they’d received. I know it’s not exactly the done thing to review a film purely against the general opinion of it, but I wanted to express my disappointment, especially as I’d heard comparisons to both The Dark Knight and The Empire Strikes Back, so my hopes were raised far higher than they perhaps should have been. OK, like I said, not a bad movie. It’s funny where it needs to be – Cap has a list of things he needs to catch up on, from which Star Wars has been crossed off but he still needs to get to Nirvana and Steve Jobs – and his relationships with both Scarlett Johansson’s Natasha and Anthony Mackie’s Sam were great, possibly improved by the direction of the Russo brothers, who made their names directing comedy with Arrested Development and my beloved Community. 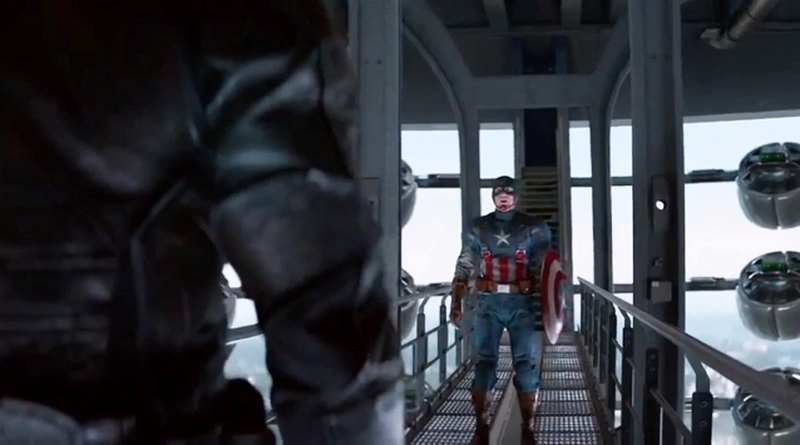 There’s great action, from an initial raid on a ship seeing Cap singlehandedly take out a small army in hand-to-hand combat, to the also over-hyped elevator sequence, that would have been a darn site more impressive had I not heard all about it beforehand. There’s possibly a few too many scenes that ostensibly equate to two guys smacking each other around for a few minutes, and I’m getting tired of seeing a giant ship crashing down to the planet’s surface in blockbuster climaxes, so if we could please stop doing that soon, it would be appreciated. So far, I haven’t outright hated a Marvel movie. Some have been mediocre – The Incredible Hulk, Captain America: The First Avenger, Iron Man 2 – and others have been pretty damn phenomenal – Iron Man, The Avengers, Guardians of the Galaxy and – say what you will – I absolutely love Iron Man 3 and genuinely have never understood the many complaints that films receives. This film sits between those two groups – alongside the Thor movies, I’m still undecided on them. However, Marvel are starting to piss me off with their slate of films looking far into the future, where movies yet to come out are casting a shadow on those just being released. I knew, for example, that there was no possibility of either Captain America or Black Widow dying in this film, because they’re both in the promotional material for The Avengers 2. Similarly, when a main character appears to have died, I folded my arms and said “Nope,” because his contract still includes more movies. I wasn’t necessarily expecting any of these people to be killed off, but when the threat is removed even before the film has hit theatres, that lessens the experience in my eyes. I have no problem with Marvel stating when they have films scheduled to be released, but I don’t think they need to tell us exactly what those films will be and who will definitely be in them until nearer the time. OK, rant over, back to this movie. The usual criticism of Marvel-fare tends to be leveled at the villain, and The Winter Soldier unfortunately suffers the same fate. I knew going in that the eponymous antagonist was somehow supposed to be one of Cap’s allies from the first movie, but I couldn’t for the life of me remember Bucky Barnes at all, even when I went back and saw some clips. He has an interesting look and a cool metal arm, but if it weren’t for the images in this post I’d have already forgotten him. Robert Redford is decent in his role (If you weren’t expecting him to be a villain, shame on you. Plus, watch more movies.) but he doesn’t really stand out. And it was fun seeing Jenny Agutter, reprising her role as a SHIELD councilwoman, kicking some arse late in the movie. If you’re not familiar with Agutter, she’s a bit-player in a lot of British movies, going as far back as The Railway Children. She was also, of course, the nurse in An American Werewolf in London. Anyway, I found it amusing that she got to do some fighting, especially because I’ve most recently seen her playing a nun in Call the Midwife. Sometimes the dialogue was a little lazy and predictable – Coby Smulders, as Nick Fury’s right-hand woman, is at one point tasked with something to do, and requests four hours. Sam Jackson retorts “You have three.” I got the feeling that no matter how much time she requested, she’d have been allowed 75% of it, for no other reason than it makes it seem more urgent and Jackson gets to be both dominating and cool. Speaking of cool, The Falcon, as portrayed by Anthony Mackie’s Sam, a war veteran with a flying suit, was pretty damn awesome. It helps that Mackie is generally a cool dude (seriously, why hasn’t this guy had his own movie yet?) and I hope that any future movies include him too. As in, put him in Avengers 2, even if it’s just so Iron Man can make fun of his wings. It helps that as a character, Captain America isn’t very cool, so by comparison whomever he is stood next to instantly becomes cooler in contrast, but still, it’s Anthony Mackie. So, The Winter Soldier. It was OK, I suppose. Not terrible at all, just not as astounding as everyone kept telling me. I appreciate that it actually had an effect on its own world, so that any future Marvel movies will theoretically have to deal with the events that took place in this one, in a similar way to how the events of The Avengers have continued to be referenced and have repercussions on every movie since. However, in future, if everyone could just calm down when they think a film is better than average, I think it’d work better for everyone. By all means like a movie, just don’t claim it’s the best ever when it’s clearly just a little ahead of the current pack. This entry was posted in 07/10, Choose Film, Empire Top 301, New Release, Review, The List and tagged Alan Dale, Anthony Mackie, Anthony Russo, Captain America, Captain America: The Winter Soldier, Chris Evans, Cobie Smulders, D.C. Pierson, Danny Pudi, Garry Shandling, Hayley Atwell, Jenny Agutter, Joe Russo, Robert Redford, Samuel L. Jackson, Scarlett Johansson, Sebastian Stan, Toby Jones by jaycluitt. Bookmark the permalink. Guilty as charged. I’m one of those who thinks this is a great comic book flick. That said, I try to go into these things avoiding as much of the hype as possible. For that reason, I’m totally on board with you that there’s just too much info coming out too far in advance of these movies. Honestly, I don’t understand why people.seek out all this stuff. It robs them of much of the mystery we watch movies for. I’ll stop before my own rant gets too lengthy. Let’s finish by saying that I even though I disagree with your overall assessment of just how good this is, I enjoyed your review. Thanks Wendell. I also think the theatre experience may have improved the movie – it’s a big summer tentpole, made for giant screens, giant speakers and a giant audience, not necessarily a family viewing at home. I agree that I was surprised by all the praise this received. I liked it and gave it a positive rating, but I hardly consider it one of the best superhero movies ever made. It wouldn’t even make my Top 5 Marvel Avengers related movies. I agree the addition of The Falcon was the best new thing. I agree the main villain was underwhelming. And once again I agree that I am amazed that ANYBODY could possibly be surprised that Redford was a villain, yet that is the very thing I see getting praised so much about the movie – the “awesome twist”. Another thing getting tons of praise are the hand to hand combat scenes. Except you can’t see what’s happening in the damn things because of the heavy shakycam used to shoot them. If I was one of the actors that had practiced literally for months to get the fight choreography perfect, nailed it when the scene was shot, then watched the result and realized I could have simply half-assed it and no one would have noticed, I would have been seriously pissed off. Finally, this movie felt like nothing more than a transition to set up the TV show and the next Avengers movie than it felt like it was a necessary Captain America story. He was practically an extraneous guest star in his own movie. Only the scene with the older Peggy really mattered for his character. I get the feeling the film-makers didn’t want this to be a fish-out-of-water film, with Cap spending big chunks of the story experiencing modern life, because they’d already done that with Thor, and other than that aspect I’m not sure what you can really do with his character, other than the relationship aspect, so I’m not surprised he got sidelined. I am disappointed though, because as you say this is supposed to be his film. And yeah, the fight scenes were very choppy. I didn’t mind too much, but I could see how the actors involved could be pissed. Jay, I think you’re thinking too much responding to all the praise and not just looking at the film itself. It’s a really sharp thriller that doesn’t feel like a normal Marvel film. I just watched it a few weeks ago, and I knew it was very well-liked. Even so, it still worked for me better than expected. I’m not saying it’s the greatest super hero movie of all time (that’s obviously between Batman Begins or Hellboy 2), but it’s a step above the average Marvel film and in the upper tier. I’m totally cool if you didn’t love it; I just hope it got a fair shake. I tried to give it a fair shot, and who knows maybe I’d like it better if I watch it again, but I still gave it a positive score (7/10) and a Choose Film rating, so I didn’t hate it. I agree that at times it doesn’t feel like a Marvel film, particularly when Cap and Black Widow go off on their little side mission, but too often it fitted securely into the same mould as all the others, especially for the third act. No argument on Batman Begins and Hellboy 2, I love both those movies, especially the latter. That’s definitely a film that doesn’t get a fair shake, you’re maybe one of three people I ever hear mention it.